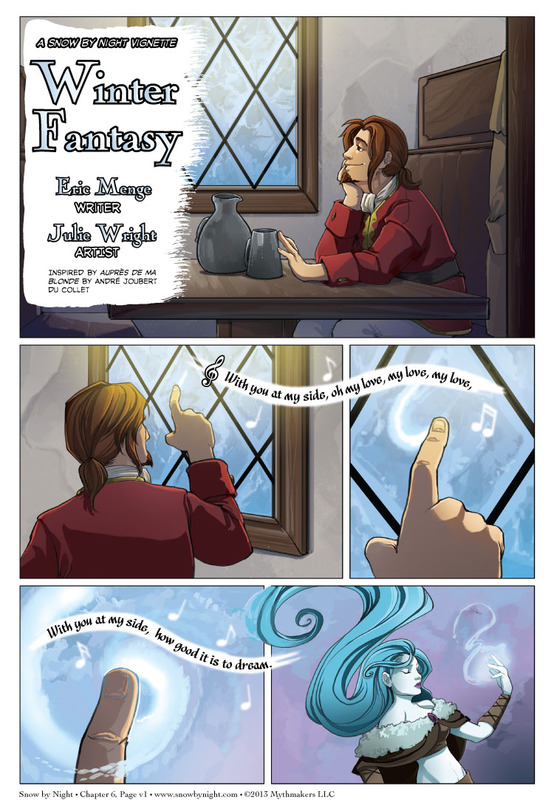 Today we begin with page 1 of Winter Fantasy. This vignette is the first to feature a main character. Normally, I use the vignettes to tell stories of side characters, but I wanted to show some of what is going on inside of Blaise’s head at this moment. His head is filled with bubbles and streamers as he delights in his new-found love. With such thoughts, it was only fitting that the vignette be a musical number. Yes, a musical number. I wanted to see if I could pull off a musical number in a comic format. To do that, I recruited Julie Wright. She is an amazing artist who is the colorist for The Dreamer as well as one of the creators of Ianua. She rose to the challenge and the art she produced is breathtaking. The melody I’ve chosen for Blaise’s love song is Auprès de ma Blonde, a traditional French song that dates back to the 18th century. It’s a drinking song that then became a marching song. Leave it to Blaise to make a drinking song into his love song. The most endearing version of this song I could find is by nondepouk on YouTube. It’s fantastically sweet and simple – one man with a guitar, which is how I figure they would have sung it on the frontier. ~<3 I already love it! This is consistently one of the highest-quality comics I follow, with the highest-quality guest strips. Well done.